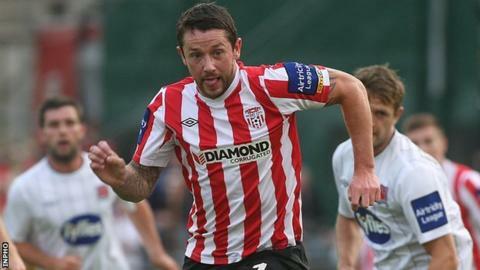 Rory Patterson's 13th-minute goal ensured Derry City's passage into the EA Sports Cup quarter-finals at the expense of Sligo Rovers on Monday. Patterson ran onto a through ball from Barry McNamee and shot low past Richard Brush for the match-winning strike. McNamee and Patterson had other first-half chances, while Ciaran Gallagher saved from Sligo's Kalen Spillane. Roddy Collins and Nathan Boyle went close for Derry after the break, with Sean Maguire heading over for Sligo. After Patterson had given the Candystripes the lead at the Showgrounds, McNamee fell over as he was about to shoot at goal. Patterson then headed over the top when he could have extended his side's lead. In the second half, Collins's first-time shot was brilliantly tipped over by substitute home goalkeeper Gary Rogers. Boyle was just off-target for Derry and Gallagher saved a Maguire header, before the same player headed over from point blank range in the dying moments.